Following URBED's Wolfson Economics Prize win in September 2014, David Rudlin was invited by Sheffield City Council to look at how the ideas might apply to Sheffield. Part funded by the council, and partly by URBED’s prize money, the study has developed into an urban companion piece to our Wolfson Essay. Our original essay looked at the fictional small city of Uxcester, a place with limited capacity for new housing within its urban area. We suggested doubling the size of Uxcester by building on just 7% of its greenbelt by building garden city extensions linked by tram routes. We were criticised at the time for promoting green field development. We did in fact argue in the essay that 60% of housing nationally should be built within urban areas – it is just that we should also plan for the other 40%. Sheffield has allowed us to look at a very different type of settlement. The conurbation (that includes Rotherham) has a population of just over 800,000 in 351,000 homes. Our report suggests growing this by 100,000 homes over the next 20 years by building 5,000 homes and creating 4,000 jobs a year. This is substantially above the city’s household projections. We suggest that the national need to build more homes is a huge opportunity to rebuild our great provincial cities. The report cites Zipf’s law of cities that suggests that most countries have a second city that is half the size of the capital, which in the UK would mean a city of around 4 Million. Manchester and Leeds are already pursuing ambitious growth plans and Sheffield needs to do the same. Population growth will fuel economic growth in these cities as well as taking the pressure off surrounding rural areas. There is a widespread view that we can build all of the homes we need on brownfield land, with no need to build on greenfields. Our Sheffield work has allowed us to test this proposition. What we found was that, while there is a lot of brownfield land within the wider city region most of it is not within Sheffield. In a city vacant land doesn’t stay vacant for long, it is used for parking or other low value uses. Sheffield have estimated that there is only capacity for around 20,000 homes on brownfield land within the city. Our report explores how we might increase this figure through urban intensification and remodelling to around 70,000 homes. This still leaves 30,000 homes to be accommodated outside the urban area as sustainable urban extensions. This is an independent piece of work, done in close collaboration with Sheffield Council but not necessarily representing their views. It says many things that may be controversial and politically sensitive, whether it be intensifying popular neighbourhoods or building on green space or extending into the green belt. But the hope is that it will stimulate a debate about urban growth and a much bolder more positive approach to city planning. As Dave Caulfield Sheffield’s Director of Regeneration and Development Services says, this is proper planning of the kind that Abercrombie used to do and is something that cities need to do once more. England somehow seems to have mislaid its second city. In most nations there is a second city that is roughly half the size of the first city which, in England, would mean a population of around 4 Million. In the Victorian era the potential second city was Manchester, in the 1960s it was Birmingham and for a short period it could even have been Sheffield. Without this second city we find ourselves struggling to do everything we want to do; business, government, media and culture in the overheated, crowded capital, while in the Midlands and the North there are cities able and willing to step up. It is not just a second city that we lack – all of our provincial cities are under-sized and under-perform economically. They all need to grow. This report considers how one of them, Sheffield, might do that. The problem of course is that far from growing, all of our provincial cities in fact shrank in the second half of the 20th century. A combination of economic restructuring, suburbanisation and the economic draw of London saw all of our cities lose population and economic activity particularly Manchester and Liverpool (and Glasgow in Scotland). Sheffield’s population loss occurred later, and was less pronounced but the city is still smaller than it was at its peak in 1951 when it was home to 577,000 people. However in the last ten years something remarkable has started to happen. All of the provincial cities have started to grow again. Sheffield gained nearly 50,000 people between 2001 and 2011. A combination of economic revival in the early 2000s combined with a resurgence of city centre living and the renewal of inner city districts saw a period of rapid growth, reversing the trend of the previous decades. True the pace of growth has slowed since the 2008 recession but it has not gone into reverse. Set along side this is a national housing crisis. We need to be building around 240,000 homes a year to deal with population and household growth and in the last few years we have managed less than half of this. This is causing stress within the housing market and meant that housing became a major issue in the 2015 general election. There is a great deal of debate about the extent to which the planning system is part of the problem or part of the solution but it is certainly the case that many authorities are struggling to find the space to allocate their projected housing needs. If we place the argument that our provincial cities need to grow alongside the requirement for substantially more housebuilding then the solution seems obvious. Rather than foist housing on unwilling rural authorities, why don’t we build within our cities, replace their lost urban populations and use their vast reserves of brownfield land. When URBED won the Wolfson Economics Prize in 2014 by setting out proposals for the expansion of a prosperous medium sized city onto its surrounding green fields, we were accused of ignoring this urban agenda. Our essay did in fact say that 60% of all new housing should go onto brownfield land and argued that the cities of the north could go much further. This report for Sheffield has allowed us to redress the balance by looking in detail at how the principles in our Wolfson essay might be applied to a major city. The starting point for this has been to understand the area that we are dealing with and the level of growth that we should be planning for. Neither question is as easy to answer as it may seem. In terms of the area, we decided early on that the city region was going to be too large to study, while the boundary of Sheffield City was too small. 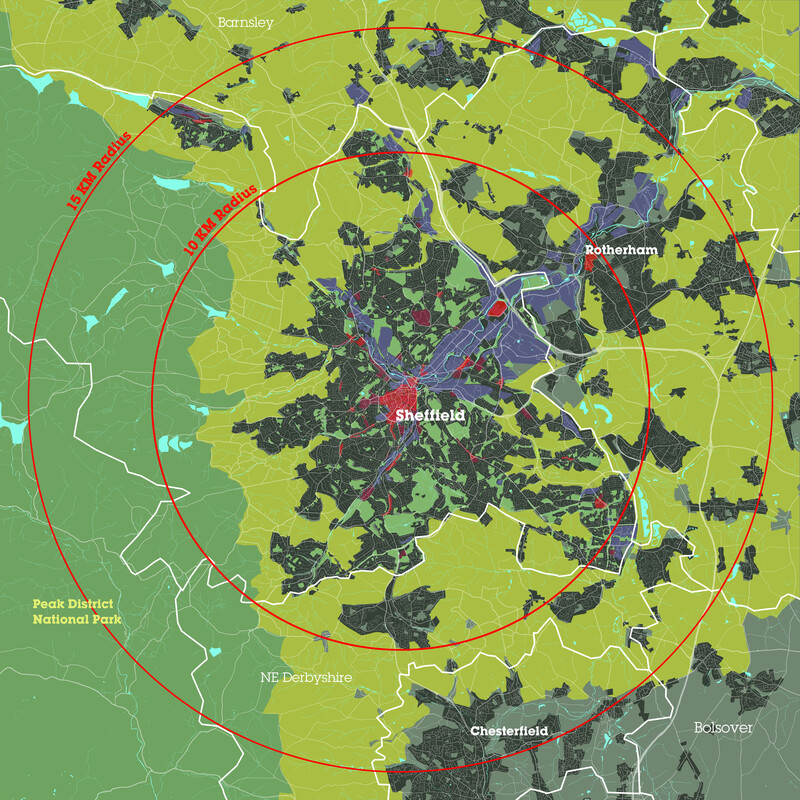 In Uxcester we confined our proposals to a 10km circle drawn around the city centre and in Sheffield we decided to expand this to 15km to take in the functional conurbation of Sheffield, Rotherham, and small parts of NE Derbyshire, Chesterfield and Barnsley. In terms of housing numbers our starting point was the proposals being developed in the City Region to create 70,000 jobs over 10 years. These employment targets are generating housing requirements based upon assumptions about who will take these jobs, how many will be local and how many will be in-comers. These assumptions produced a spread of housing requirements for the city region up to 200,000 new homes, half of which would need to be accommodated within our 15km radius. It is true that the more recent population projections following the recession have reduced these numbers, but we have stuck to the higher figure of 100,000 new homes within the 15km area circle around Sheffield. This is a combined figure for both Sheffield and Rotherham but is higher than the housing projections currently being considered by both authorities. We have used this higher figure because we believe that growth is good, as we describe in Part 1 of this report. We believe that the Sheffield conurbation needs to pursue a much more ambitious growth agenda, as Manchester is doing. Indeed, like the Centre for Citiesx we believe that population growth is a catalyst for economic growth rather than vice versa. Growing the population, increases the catchment spending power – supporting projects like the New Retail Quarter. It generates income for the council and makes the city’s workforce more attractive to employers and more likely to generate new businesses. Urban capacity: We start by looking at brownfield housing capacity that has been estimated by council at a little over 20,000 homes. There are much greater areas of brownfield land in the city region. However only a small proportion of this is within the city where land tends not to stay vacant for long before it is occupied by low value uses like parking and yard space. We do however assume that brownfield land is a dynamic resource that is created as quickly as it is used up. We therefore felt able to anticipate that over the 20 year plan period the current stock of brownfield land, plus new brownfield land, would provide a capacity of around 32,000 homes. Urban Intensification: There are many other types of urban capacity such as the subdivision of larger homes, backland development, the intensification of low density council estates (of which there are many in Sheffield), the development of car parks etc... The main impediment to this capacity coming forward is often the planning system itself. We estimate that there is capacity in the study area for 18,000 homes from this source. Remodelling: We identify two parts of Sheffield that were once busy residential neighbourhoods and now have very little housing; Neepsend and Attercliffe. They are now characterised by relatively low density commercial use (that is nevertheless protected by planning policy). We suggest that such uses are not appropriate within a mile of the centre of a city like Sheffield and the neighbourhoods could be remodelled as in-town Garden Cities (or Sustainable Urban Neighbourhoods). These two areas we estimate could accommodate 20,000 homes. Accretion: The response of most planning authorities to this problem has been either to look at the next field around the edge of the settlement or to seek to export growth to surrounding districts. Neither are very sustainable forms of development and cannot easily be served by public transport or existing services so become car-dependent. We suggest that there may be some small scope for accretion (5,000 homes) where sites are near to existing centres. Extension: Which leaves us with urban extensions. As we suggested in our Wolfson Essay we believe that it is better to take a confident bite out of the green belt rather than nibbling around its edges. We therefore suggest that the majority of the conurbations goes into urban extensions and suggest Mosborough (which was planned as an extension in the 1970s), Waverley (which is already being developed by Rotherham) and three smaller extensions at Bassingthorpe (also allocated by Rotherham), Oughtibridge and Stocksbridge in total accommodating 25,000 homes. This achieves 100,000 homes and in Part 3 of this report we start to explore how this might be realised and what structures would need to be put in place. It is possible that the Government may introduce powers in this Parliament to facilitate housing growth zones or garden cities and this report provides a starting point for the sort of initiatives that Sheffield could put forward for these programmes. Key elements of any strategy will need to be mechanisms to assemble land and to value its capture for investment in new infrastructure such as extensions to the tram system. The problem is that very little of what we say in this report is compatible with the planning system as it currently operates. Much of the 70,000 home capacity of the urban area cannot be measured to the satisfaction of a planning inspector and in any case would fail the deliverability test. If Sheffield were therefore to go with the ambitious growth figures that we suggest they could find themselves forced to make more greenfield allocations. The best way to avoid this is to downplay the city’s growth figures. This of course is why we struggle to build the second, or indeed the third, fourth and fifth cities that we need as a country.